There are hundreds of reports that you can run to dig into your marketing. But the question is often where to start -- what are those basic reports you can run to help get you comfortable digging into the copious amounts of data at your fingertips? Some important metrics that you should track are traffic, leads, and customers -- all of these are important to get the full picture of your marketing funnel. But you probably already look at that stuff. Having the ability to dig in even further to see where your traffic and leads are coming from, what content they interacted with, when they converted, and how long it took to close are important to really uncover meaningful, actionable data. This post will help you get at that -- it compiles some of the reports that can get you started on some of the basics in marketing reporting. Since we use HubSpot for our reporting needs, I'll show you how to compile these reports using HubSpot. (Bear in mind that the data below is sample data only, and does not represent actual HubSpot marketing data). It may be helpful for marketers to be able to tie their marketing efforts back to the amount of revenue their marketing generates from that particular channel. That way marketers can look at the success of certain channels over others and make smarter investments based on what channels generated the most revenue. Note that if you're a B2B business, it may be more important for you to create your reports based on company data instead of individual contact data., so you may use a companies report instead of a contacts report. 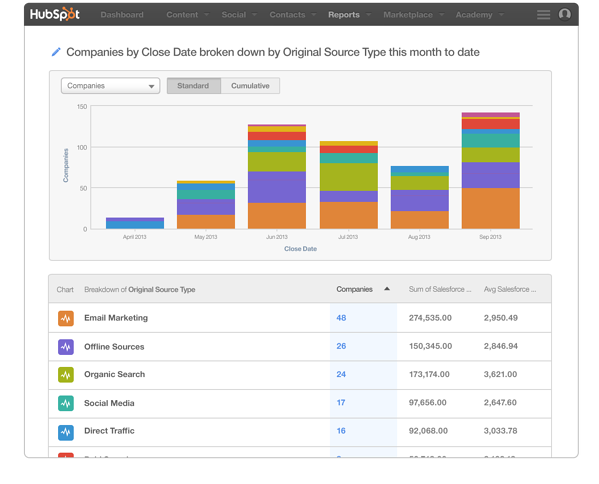 HubSpot customers can pull revenue data based on any contact properties they have in HubSpot using the new Companies Report. So if you wanted to pull it based on source, you'd simply select the date range that you want to analyze, choose "Original Source Type" to make up your bar graph, and select "Salesforce Total Revenue" as the last field. Note: Enterprise HubSpot customers can do this in their software if they have their Salesforce integration set up with Account Sync turned on. Look at the revenue results of different channels, and see where you had the most success. You can use this information to decide what marketing efforts to invest in going forward. For instance, in the example above, offline sources are clearly generating a lot more revenue than direct traffic -- we can make actionable marketing and budget decisions with that knowledge going forward. If you're looking at revenue by source, it's also important to keep in mind other factors that may have contributed to the success or failure of a channel. The source is a person's first conversion on your site. But if someone converted on offline sources, and then eventually buys your product as a result of direct traffic or other channels, those other channels or the combination of channels may be the reason for your customer acquisition. This is all to say that revenue reporting is important, but you should dig into some of your other metrics, as well, for a more complete picture. Understanding where your traffic is coming from will help you make strategic decisions as you choose to invest in different channels. In some cases, if you see strong performance from one particular source, you may want to invest more resources in it. On the other hand, you may actually want to invest in some of the weaker channels to get them on pace with some of your other channels. Whatever you decide, the sources data will help you figure that out. HubSpot customers are probably familiar with the Sources graph to get at this information, but you can actually customize it more. For instance, you could pull a report based on the number of visits coming to the site, you could pull number of visits from a particular list instead of your entire database with the Contacts or Companies Report, and you can (of course) customize those views by date ranges that matter for your reporting. If you get a lot of traffic to your site from a certain channel, but the channel is not necessarily helping your visitors move down the funnel, it may mean that you should invest more in other channels or dig into ways to improve your conversion rates. Think about ways you can invest resources in your strongest channels. Did you run a campaign that helped the channel perform well? Was there a piece of content you created that set it off? Consider how you can replicate your past success. If you haven't worked on a particular channel, this could be a good time to test it out. Think about how you can incorporate multiple channels into the same campaign. Pulling this data weekly will allow you to stay up-to-date on how the channels are performing. If a channel took a turn for the worse, you'll have enough time to remedy the situation before it gets out of control. Pulling the report daily may be a bit overboard since some channels take multiple days to be effective, but pulling it monthly will not help you respond with agility. Blogs have become a marketer's best friend. There is a direct correlation between the number of times a company blogs and not just the amount of traffic they drive, but the number of leads they generate. So it's critical you keep an eye on how well your blog is helping you grow that critical metric. A blog leads report is a quick way to see how many leads you're generating on a daily, weekly, or monthly basis -- and by what channel. This report is a great way to dig into what channels are strongest for your blog, where you should spend more promotion time, and how well your content is performing over time. If you're using HubSpot, create a list to gather all of the leads for your blog. The list should have the "Contact Property of First Referring Site," "First Page Seen," and "Original Source" equal to your blog URL, and then use the list to create your contact report. Break down your report by the "Became a Lead Date," and break down the contact properties by "Original Source" if you would like to see the channel they're coming from, not just the leads number. Take a look to see how people are finding your blog content. Did you run an email campaign that put the content in their hands? Are you doing a lot of promotion on social media? Or are people organically finding your content? Based on what you uncover from this initial assessment, you can figure out your best channels for promoting your content. In the example above, it's clear that my strongest channel is organic search while email marketing is one of my weaker channels. That tells a resource-strapped marketer to invest more in optimizing my content for search than spending time creating emails. Take it a step further and look at how many leads you're generating from your blog over a set period of time. If you see spikes in leads generated, you know to dig into your content to see if you're more successful generating leads with certain topics over others. The more you can dig into these reports to figure out what works and what doesn't work, the better off your marketing will be. This type of data should be pulled on a weekly basis to help you adjust your content strategy for the coming weeks. Every marketer needs a good hang of their buyer personas -- but you need to do more than just understand them. 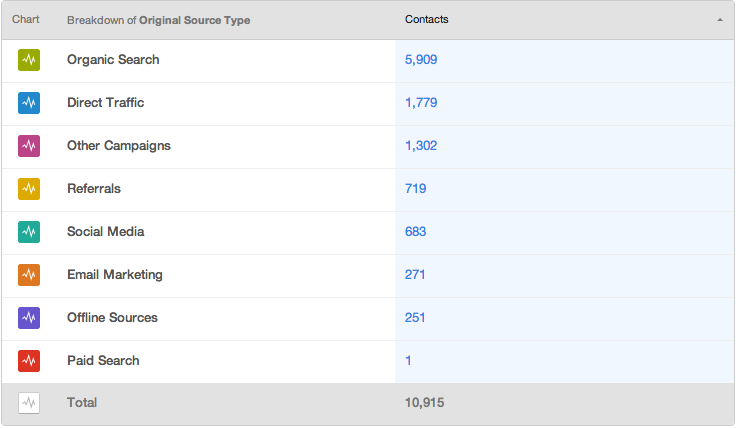 It's important to track how many new contacts you're actually adding to your database based on that persona. To report on this in HubSpot, plot your contacts by create date, which will show the date on which you added a new contact to your database. Then break down your report by persona. Pulling this report on a monthly basis can give you insight into how your campaigns affected new contacts by persona -- and might even shed light into an imbalance in resources dedicated to certain personas. Did you run a marketing campaign around a particular topic? Or did you focus on promoting your content through specific channels? 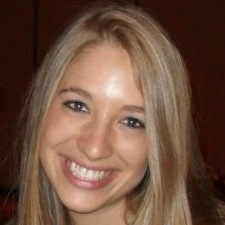 What did you do that led to an increase or decrease in persona acquisition? Digging into this report can help you allocate resources more wisely to grow different segments of your business. Another way to segment your database is to look at how they appear by lifecycle stage. This will give you a sense of how many leads, subscribers, customers, opportunities, etc. you have in your database in a certain time period. This data will help you understand if you need to generate more leads or if you should be more focused on closing your current leads. It will also give you a general understanding of the quality of your database. Simply choose if you want daily, weekly, or monthly data, plot your contacts by their "Create Date," and break the report down by their lifecycle stage so you can see a report like the one below. This report will give you an overview of how many leads you're generating by each lifecycle stage. 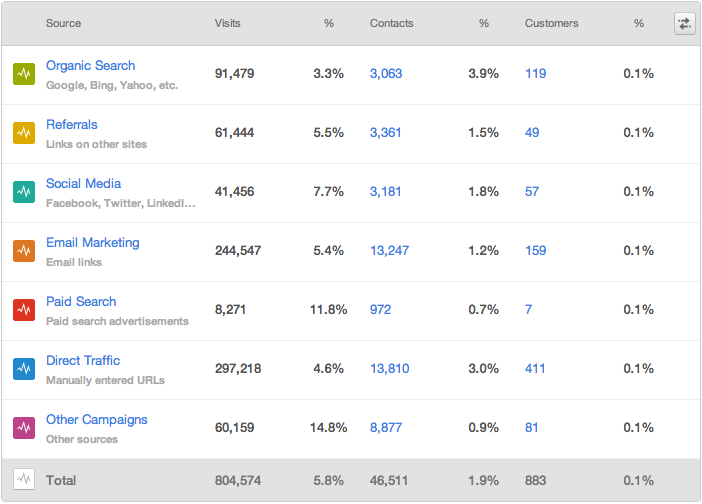 It will also give you a visual overview so you can see how these leads are moving through your funnel. Use this report to see what areas of your funnel you need to address for greater funnel efficiency -- no one likes a clogged funnel, least of all Sales. If you see there are not a lot of marketing qualified leads in your system, for instance, you may want to create a report that digs into the reasons why. 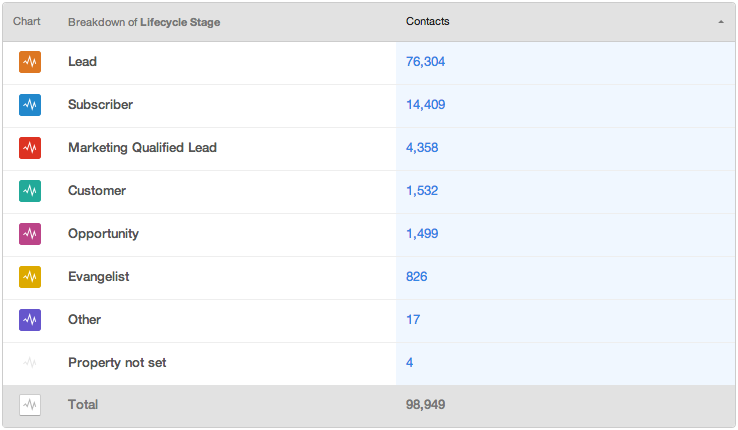 Pulling reports of the first conversion date, days to close, and content offers can help you uncover why the contacts in different lifecycle stages may be high or low. If your company does inbound marketing, chances are you're going to have a lot of content on your website. Figuring out what content performs the best is important as you plan out your content strategy. Maybe certain types of offers like whitepapers are more popular than webinars, for instance. Or certain topics could resonate better with your audience than others. Understanding your audience's content preferences is very valuable information to have so you cater to their interests. Using HubSpot, you can pull data to show which offers generate the most leads. Let's take ebooks as an example. Create a custom property for ebook source. Then go to your ebook landing page forms, and put a hidden field with the customer property you created for ebook source. Under default value, write the name of your ebook so your contact's record indicates that they downloaded that particular offer. After your ebook has been live for a couple of weeks, take a look at its performance in comparison to some of your other ebooks. See if you can see trends between the different ebooks. Does a certain topic consistently perform well? Did an ebook perform better on social media than via email marketing? Try to find those trends based on the data to figure out which ones you can promote more and which ones should take the back burner. Alright marketers, what other reports do you think are important to run? Share with us in the comments.